FOXBORO, Mass. 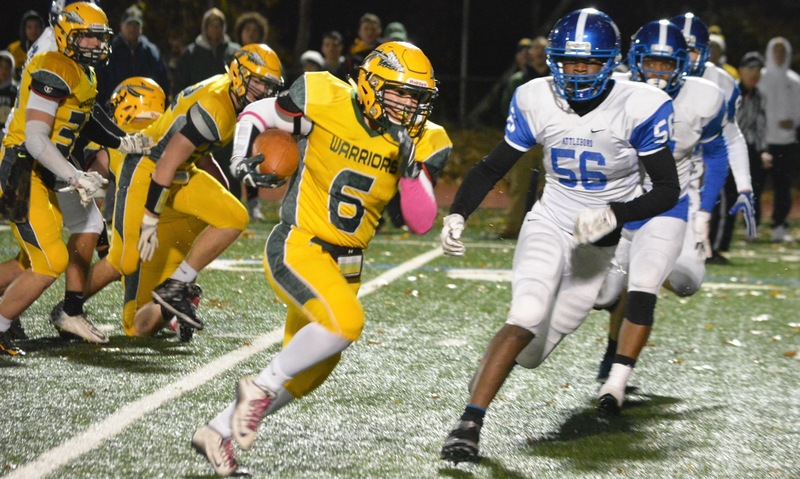 – Throughout the 2016 season, King Philip head coach Brian Lee has said time and time again that the Warriors can throw the ball – they just don’t like to if they don’t have to. Through the first 11 games, the running game was more than sufficient. But in the D1A State Championship, KP had to rely on the passing game – and Lee was right, the Warriors can throw the ball. 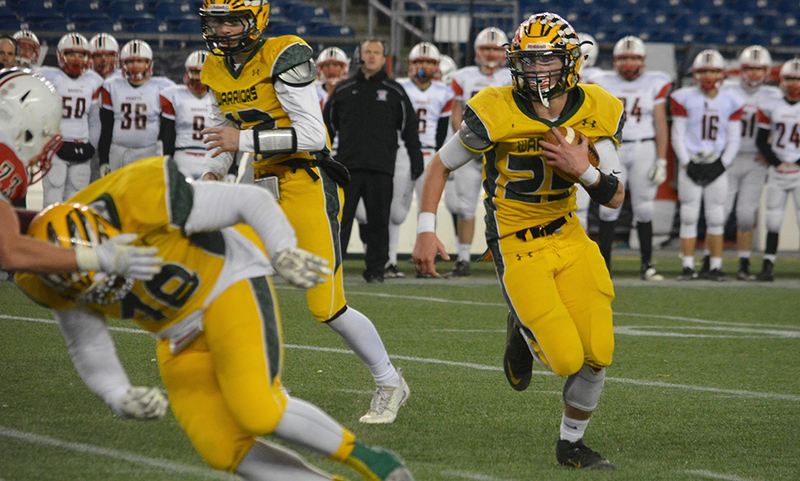 Using an impressive aerial attach and it’s typical hard nosed defense, King Philip defeated Reading, 21-18, at Gillette Stadium for the program’s first ever state championship. “Reading has an awesome defense, we could not [run the ball],” Lee said. “There were a lot of dudes in there and they were big and strong and physical. We just knew they were not going to let us do what we wanted. We worked on throwing the ball more in practice. We’ve been saying we can throw it, we just don’t like to if we don’t have. King Philip’s running attack has given teams fits as season but the Rockets’ defense was stout throughout the first half, bottling up run after run by the Warriors. KP’s defense kept things close but after a scoreless first quarter, the Warriors had just nine yards after two offensive series. Reading was able to move the ball on its second series of the game, even converting a fourth down a fourth down on the first play of the second quarter at the KP 19-yard line. The Rockets were forced to go for it again on fourth down from the 13 yard line but Reading quarterback Corey DiLoreto’s pass was dropped in the end zone. A 45-yard gain by Gio Fernandez finally gave King Philip’s offense some life as they moved into Reading territory. But a penalty forced KP back and 10 yard gain on fourth down from Brendan Lydon (13/18, 256 yards, two touchdowns) to Fernandez came up a yard short. One play into Reading’s third series, Nick DiNapoli took the toss to the right side and got around the edge and sprinted his way for a 79 yard touchdown. A failed two point rush gave Reading a 6-0 lead with 3:11 to go in the first half. On the next series, King Philip began its commitment to the passing game. Facing 3rd and 20, Lydon hit senior Tyler Jenesky over the middle for a 24 yard gain and a first down. Two plays later, Lydon connected with David Morganelli for 14 yards and another first down. After another completion to Jenesky, Lydon connected with Ethan Dunne on a post route for a 14 yard touchdown. Freshman Cole Baker’s extra point (3/3 PAT) gave KP a 7-6 lead with 28 seconds left in the half. Reading fumbled the ensuing kickoff and KP recovered at the Rockets’ 30 yard line but the refs ruled the runner down and the team’s headed into the halftime break just a point apart. King Philip’s defense forced a punt on the opening series of the second half and took advantage with its offense. On the first play, Lydon went play action and found a wide open Brett Mazur for a 62 yard completion. An eight yard pass from Lydon to John DeLuca (45 all purpose yards) made it 4th and 1 from the 2 yard line. Lydon called his own number and bulled his way into the end zone and Baker’s second extra point put King Philip up 14-6 with 6:34 in the third quarter. After KP’s defense forced another punt, the offense marched down the field again but Lydon was picked off in the end zone to end the threat. On the ensuing offensive series, Reading opened up its playbook, going with a double reverse with receiver Matt Panacopoulos connecting with Eric D’Agostino for a 50 yard touchdown. However, the two point pass sailed high as KP held a 14-12 advantage with 9:48 left in the game. It certainly didn’t take King Philip long to respond those. After a one yard gain on first down, the Warriors went play action with Lydon once again finding an open Mazur, who fought off a defender and scampered in for a 69 yard touchdown. Baker’s third extra point put KP up 21-12. “It was confidence and [Brendan’s] really calm,” Lee said of his quarterback. “After he made the mistake, he comes back and puts the ball on the money down here, just unbelievable. After getting the ball back by stopping Reading on downs, King Philip was faced with its own fourth down from the Reading 37-yard line. It looked as though Lydon connected with Mazur again, who clearly got one foot down in bounds, but the ref ruled it was out of bounds and KP turned it over on downs. The missed call was costly as Reading connected for a 63 yard touchdown on its ensuing drive. DiLoreto hit DiNapoli, who slipped by a pair of defenders and raced the rest of the way. The extra point attempt sailed wide with 3:38 to go. 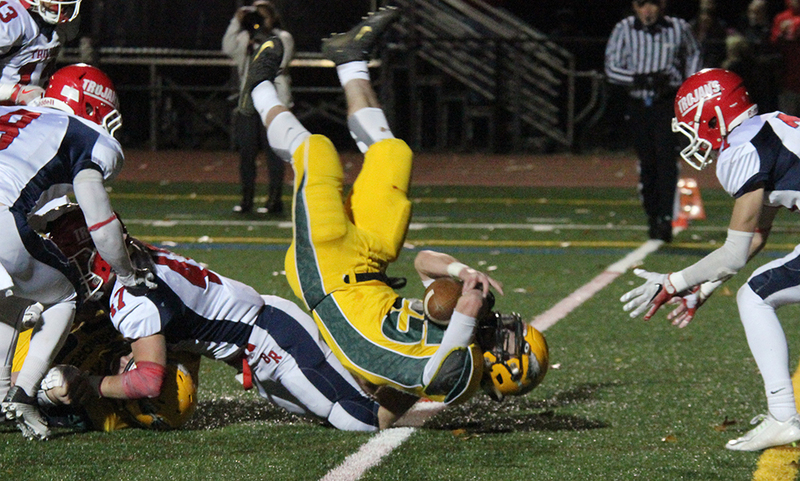 For the second straight playoff game, Liam Cullagh came up with the onside kick attempt. The Warriors used back to back handoffs to DeLuca to earn a first down and two runs from Shame Frommer resulted in six yards, but KP faced 4th and 5 with 1:08 to go. Lee put his faith back in the passing game. Jenesky came in motion from left to right and split out with DeLuca heading in the opposite direction. That left Jenesky open for the catch and 16 yards, converting the first down and giving King Philip the win. It was Jenesky’s third catch of the game – he had just two all season prior to the game. For Lee, the program has come a long way since he took over in 2005. ”No disrespect to anybody but football was in a very bad spot when we got there,” Lee said. “I was just hugging it out with Rich Hardwood, who has helped me build this program and made sure these kids have what they need. As a regional school you lose a lot to Xaverian and we lost a lot to Feehan in the beginning. We were always trying to get the kids and the community to buy in. Building a culture is harder than building a team. Coming out today and seeing all of those people, I was like where are we? It’s taken 12 years to build this. “If you’re a young coach out there and you say our school doesn’t have it, this is not the right place, we can’t win here…you’re doing yourself a huge disservice. You can win anywhere, KP proves it. You win at KP, you can win at everywhere. King Philip finishes the season 12-0 as D1A State Champions. FOXBORO, Mass. – With 1:45 remaining in Saturday night’s Div. 1A Super Bowl, King Philip faced third and eight from the Reading 38-yard-line. The Warriors went to their bread and butter and gained three yards to the 35. KP ran the play clock down and called timeout. There was confusion when they lined up, so the Warriors had to call their final timeout as well. 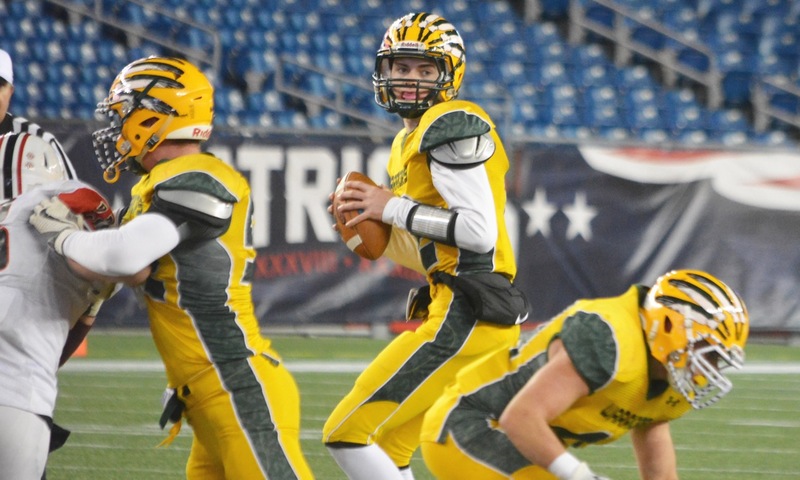 Knowing that five yards would seal the program’s first state title, King Philip put the ball in the hands of junior quarterback Brendan Lydon. He delivered. Lydon flipped a perfectly-timed pass to Tyler Jenesky (three catches, 43 yards) in the flat for a 16-yard gain and clinched the state championship at Gillette Stadium. “If we had gotten a few more yards on third down then we probably would’ve gone with the run,” said senior John DeLuca. “We called in our go-to play, which is a flood right… Luckily, the Reading guys got mangled up with me when I was doing a 10-yard out. [Tyler] was wide open and able to seal the game. King Philip has been a run-first team under head coach Brian Lee. 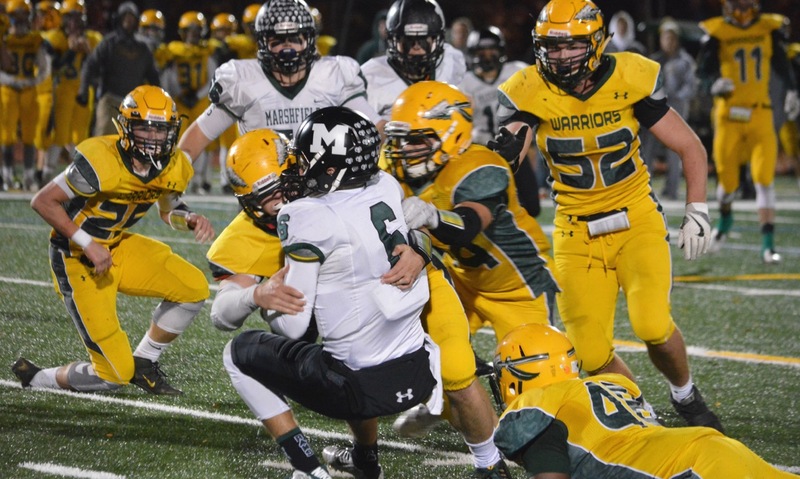 The Warriors are a team that likes to grind out wins with an old school style that flies in the face of the typical spread formation, pass-happy offense that have become commonplace in high school football. But, in the biggest game in the program’s history, the Warriors turned all of that on its head, throwing 18 times against a Rockets defense that was piling numbers into the box. Lydon completed 13-18 passes for a career-high 256 yards and totaled three touchdowns (two through the air and one on the ground). DeLuca, who was the starting quarterback for the past two years before moving to receiver in the preseason, praised Lydon for his preparation for the Super Bowl and for being ready when his number was called. The Rockets knew the typical KP game plan was to keep the ball on the ground, but on the third possession of the first half Lydon surprised Reading with a play action pass to Giovanni Fernandez for the Warriors first big gain. That drive ended with a turnover on downs, but it showed the capability of KP’s passing attack. On its next possession, KP took the lead with a touchdown pass from Lydon to Ethan Dunne. In the third quarter, Lydon used another play action fake to open up Brett Mazur downfield for a huge gain inside the Reading 10. That same combo hooked up again in the fourth quarter on a 69-yard touchdown that turned out to be the game-winner. Lydon shrugged aside questions about whether or not he felt more comfortable in the offense now compared to his first start this season at North Attleboro. WRENTHAM, Mass. – The rest of the state is starting to find out what King Philip head coach Brian Lee has known for some time now: this year’s Warriors squad is special. As King Philip landed punch after punch in its D1A South Final matchup with Bridgewater-Raynham, some in the fourth quarter even appearing to be knockouts blows, the sixth-seeded Trojans continued to land counterpunch after counterpunch. But in the end, the Warriors made the plays they needed to — plays that make a team special — as they held off the Trojans, 33-28, to claim the D1A South Sectional Title and book the program’s first ever trip to a state championship. King Philip (10-0) will take on Reading (8-2), winners of the North Sectional, in the D1A State Championship game on December 3rd at Gillette Stadium. The Warriors set the offensive tone early, marching 80 yards on 18 plays, taking up 9:40 of the first quarter, punctuated by a 5 yard keeper from Brendan Lydon to go up 6-0. But it was the plays in the fourth quarter that proved to be the difference. An early fourth quarter touchdown from Shane Frommer (30 carries, 188 yards, two touchdowns) on a 4 yard run gave the Warriors a slim 27-21 lead after a blocked PAT. As Bridgewater-Raynham tried to land its counter punch, as it had done multiple times throughout the game, the Warriors’ defense came up big. The Trojans used six straight running plays to advance into KP territory but elected to go for it from there. Three straight incompletions – the last on fourth down – forced a turnover on downs. Fourteen yards from Frommer and then 16 yards from Gio Fernandez (seven carries, 54 yards) helped KP move the chains quickly on back to back plays. But three straight runs totaled just four yards, forcing KP into a 4th and 6 from the BR 24 yard line and 5:04 left in the game. Frommer sure did, taking a handoff to the right side and bouncing outside to find some space, the run going for 17 yards and a first down. Two plays later, Lydon used a sneak to get in from a yard out to put KP up 33-21 with 3:48 left. “This is the most amazing day of my life,” an elated Frommer said after the game. “We practice every day for this. It started in June with Gut Camp – we wake up at five in morning every day just to work out. I can’t even explain it right now, I’m so pumped. Frommer was quick to credit linemen Daniel Loewen, Paul Macrina, Nate Gudas, Max Penner and Carl Sanuth. Fernandez and fellow fullback Alex Olsen (six carries, 29 yards) also provided key blocks, as well as tight end Brett Mazur. Bridgewater-Raynham made the game interesting, quickly moving into KP territory. It looked as though the Warriors made the stop on fourth down, but a holding call kept the Trojans’ drive alive. Quarterback Corey Sullivan connected with Shawn Noel Jr. (197 all purpose yards) on a screen for a 23 yard touchdown to bring B-R within 33-28 with 2:52 left. Liam Cullagh swallowed up the onside kick attempt from B-R but KP’s offense stalled for just the second time in the game, forcing the Warriors to punt with a minute to play. With no timeouts and 68 yards to travel, B-R had to throw the ball but for the second straight week, Andrew Dittrich came away with the game-sealing interception. “That’s why I say the team is special, because when you’re used to making the big plays, and not giving up the big plays like that, when they’re happening – we scored, they scored, we scored, they block the PAT – just every time it felt like it was going to slip away or there’s a weird call against us, it’s just about the next play,” Lee said. “And it’s a hard thing to coach, I wish I could take credit for it but it’s really the guys and my assistant coaches, they do such a good job. Bryce Shaw’s touchdown early in the second quarter put B-R ahead 7-6 but KP responded swiftly with John DeLuca (four carries, 20 yards) bursting up the middle for a 12 yard touchdown. A two-point conversion from Frommer put KP up 14-7 with 4:04 left in the second quarter. Noel Jr. scored on the second play of the second half to bring the Trojans level but KP answered once again with Frommer diving in from 5 yards out. Noel Jr. once again scored to tie the game at 21-21 heading into the fourth quarter. 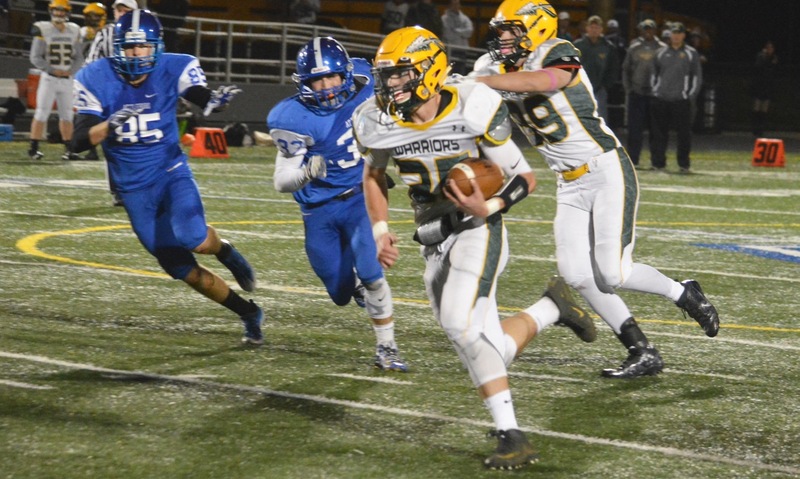 In its first Super Bowl appearance, King Philip will take on a Reading squad that shutout Malden Catholic in the first round, shutout Chelmsford in the second round and beat top-seeded Lincoln-Sudbury 21-7 in the Sectional Final. The time of the Super Bowl is still to be announced. WRENTHAM, Mass. – King Philip had the chance to run out the clock in the closing minutes of Friday night’s Div. 1A South semifinal at Macktaz Field, but Shane Frommer was stopped for a two-yard loss on fourth and two from the Marshfield 17. The Rams had one last chance after the turnover on downs to try and even the score. Marshfield, which had beaten the Warriors two years ago on the same field in the Div. 2 South final, started the drive with an incomplete pass and then a pass batted down by senior Brett Mazur. On third and 10, Jackson Phinney (8-28, 119 yards) picked out Christian Friedel for 16 yards. Two plays later, Phinney found Mike Catanoso for 39 yards and first down at the KP 26. The Warriors needed to make a play and on second down it appeared they had when John DeLuca and Frommer had Phinney wrapped up for a big sack, only to have the quarterback somehow release the ball for an incomplete pass. Phinney scrambled on third down and was hit hard after four yards by the far sideline. The officials kept the clock winding and as the final seconds ticked off the Rams barely got a play away. The ball was up for grabs near the goal line and Andrew Dittrich came up with the interception that sealed the victory. KP held on 14-7 and will play for the sectional title for the second time in three seasons. KP came into the game with a plan to slow down the high-powered Marshfield offense, which scored 41 last week against Mansfield, and it worked to near-perfection. The Rams were held without a point until midway through the fourth quarter and had only eight first downs (two in the first half). The Warriors took advantage of a short field to take the lead in the first quarter. Frommer (23 carries, 108 yards) returned Marshfield’s second punt 21 yards down to the Rams 29. Giovanni Fernandez (10 carries, 47 yards), Frommer, and Alex Olsen (11 carries, 49 yards) got the ball to the one where junior quarterback Brendan Lydon punched it in. KP also had a long drive late in the second quarter that used up nearly seven minutes off the clock. The Warriors went from their own 13 as far as the Marshfield 37 on 12 plays before a nine-yard loss ended the scoring chance. Chris O’Neil closed the half with an interception. Only seven points were on the score board but the game was being played at KP’s pace. The Warriors were methodical on offense, keeping the ball on the ground and keeping the Marshfield offense standing on the sidelines. Lee credited his offensive line of Matthew Tobichuk, Paul Macrina, Carl Sanuth, Cameron Gately, and Daniel Loewen for helping to win the time of possession battle. The teams traded turnovers on downs to start the second half, but on its second possession KP put together a drive that looked at the time like it put the game away. The Warriors went 67 yards in 13 plays with Frommer, DeLuca, Olsen, and Fernandez all getting carries. After Lydon was ruled down inside the one of a sneak attempt, Olsen got the touchdown on fourth and an inch to make it 14-0. Just when it looked as though the game was won, Marshfield’s offense woke up. The Rams went 71 yards in nine plays and used little more than two minutes off the clock to cut the KP lead in half with 7:04 remaining. A Jack McNeil end around for 35 yards was the big play and Phinney capped the drive with a two-yard keeper. As the Rams lined up for the kick-off, they stayed bunched up around the kicker and surprised KP with an onside kick right down the middle of the field. Marshfield recovered and the visiting crowd found its voice. But three plays later Ethan Dunne turned momentum right back around to the home team with a juggling interception in front of the Marshfield bench. KP tried to run out the clock and Lydon earned a first down on fourth and three with a hard count that got the Rams to jump offsides. Three plays later, the Marshfield defense made a play to give its offense one last chance. The KP defense was waiting and Dittrich made the final play to end the comeback bid. King-Philip (8-0) will host the winner of Wellesley and Bridgewater-Raynham on Friday night. WRENTHAM, Mass. – King Philip prides itself on being able to dominate the line of scrimmage and grind down teams with the running game. In the first meeting with Attleboro, the Warriors took a while to get going on the ground and head coach Brian Lee let his offensive line know that it would have to do better. Just two weeks later the Warriors had the opportunity to show that they had received their coach’s message when unbeaten and top seeded KP hosted the Bombardiers in the first round of the Div. 1A South tournament. KP amassed nearly 400 yards rushing on Friday night at Macktaz Field and rolled to a 51-21 victory to advance to the sectional semifinal. Shane Frommer led the way for the Warriors with 173 yards on 21 carries and a pair of touchdowns. Senior John DeLuca also had a big night with 130 yards on 10 carries and three touchdowns. Both runners had 100 yards by halftime. It started well for the hosts, who took their first drive 71 yards in six plays for the opening score. Frommer had all but 14 of those yards and finished the possession with an 11-yard run on a toss to the left. In the first meeting, Attleboro had no first downs in the first half, but on Friday the Bombardiers came out with a short passing game to try and counter KP’s pass rush and stay away from the run defense. For the most part, it was effective. Attleboro answered right back with an 80-yard drive of its own. Tyler McGovern (24-37, 268 yards) went 5-6 on the drive and Elvin Sam came up with the big play to tie the game, coming down with a 28-yard pass between a pair of KP corners. Sam had three catches on that drive and would finish the game with 10 receptions for 140 yards. The score stayed the same until 4:46 left in the half when KP took back the lead. DeLuca took over at quarterback in a ‘wildcat’ set and he faked a handoff to Frommer to carry over the right tackle. The senior broke free and raced 85 yards for the go-ahead score that turned momentum back to the Warriors. DeLuca capped off an 11-play, 76-yard drive with just 13 seconds before halftime. Again on a keeper, he went straight up the middle for a nine-yard score. The big play on the drive was a 29-yard completion from Brendan Lydon (3-8, 47 yards) to Tyler Jenesky on the near sideline to get the ball inside the Attleboro 10-yard-line. Unlike the meeting two weeks ago, Attleboro did not let those late scores demoralize them and came out of halftime looking to make plays. Sam jumped a route and picked off Lydon to start the third quarter and bring energy back for the visitors. McGovern hit Cam Furtado for 13 yards and the pair followed that up with a 35-yard connection for a touchdown that got Attleboro back into the game, temporarily. Frommer returned the ensuing kick 49 yards down to the Bombardiers 20. Four plays later and DeLuca got his third score of the night, this one from six yards, to push the lead back to 14. Attleboro turned the ball over on downs at midfield on its next possession and KP took advantage with Giovanni Fernandez finishing off a 49-yard drive with a three-yard burst up the middle. The Bombardiers did their best to stay in the game. McGovern tossed his third touchdown of the night on a great play-action pass to Steve Hamerski from five yards out with just 22 seconds left in the third. But, again KP had the answer with Frommer notching his second score on a three-yard carry. Fernandez added two points for KP with a sack of McGovern in the end zone on the next Attleboro possession and then Andrew Gelsomini broke a 46-yard touchdown to cap the scoring. Mansfield (8-0, 5-0) will host No. 5 seed Marshfield in the D1A South semifinal, after the Rams knocked Mansfield out of the tournament for the third straight season. It will be a rematch of the 2014 sectional final, which Marshfield won at Macktaz Field on its way to a state championship. ATTLEBORO, Mass. – King Philip had been inside the red zone three times and had held Attleboro without a first down for the first two quarters, but as halftime rapidly approached the Warriors were clinging to a 3-0 lead courtesy of a 20-yard field goal by freshman Cole Baker. With the clock winding down in the half, KP pulled out a trick play to try and break the game open. Brendan Lydon hit Ethan Dunne for 15 yards on a hook and the receiver pitched the ball to tailback Shane Frommer, who raced the final 25 yards down the near sideline to make it 10-0 at the break. KP got the ball back to start the second half and scored again. The Warriors went from just three points to three scores in front and never looked back on their way to a 36-13 victory over the Bombardiers that sealed at least a share of KP’s fourth Kelley-Rex division title in the past six years. KP dominated possession in the opening half, but struggled to finish drives. It started with an 11-play drive in the first quarter that got down to the Attleboro 10, but ended when Lydon (5-11, 78 yards) was picked off in the end zone by Cam Furtado (one of his two picks on the night). Following another three and out by the Bombardiers, KP marched down to the Attleboro 12, but Baker’s 19-yard field goal attempt was blocked. Once again Attleboro went three and out and Andrew Gelsomini returned the punt to the Bombardiers 35. The Warriors got the ball down to the three but had to settle for a kick from Baker to take the lead. KP got the ball back with less than two minutes remaining in the half at its own 38. After a false start, John DeLuca (12 carries, 74 yards) went for 10 on a keeper and then two plays later broke up the middle for a 17-yard gain on third down that put the Warriors at the Attleboro 40 with a shot to run the hook and lateral play that turned into a huge momentum swing. The Warriors started the third quarter with a 39-yard return by Frommer that set them up at the Attleboro 31. Frommer gained eight yards on fourth and two to keep the drive alive and then broke a 12-yard run to get inside the five. Lydon capped the drive with a 1-yard plunge to make it 17-0. Attleboro finally got a first down on its first possession of the second half. Tyler McGovern (5-12, 104 yards) found Elvin Sam deep down the near sideline for a 28-yard gain. On the next play, Sam (three catches, 96 yards) managed to steal the ball out of the tight coverage of Andrew Dittrich for a 31-yard completion. After a penalty, Marc Dieu pushed it across for a two-yard score that got the hosts on the board. From that point on, the Warriors wore down the Bombardiers, who lost Jason Mota to a bad leg injury in the first half and saw Andrew Gingras and Furtado not return to the game after halftime. KP continued to do what it does best and dominate the line of scrimmage with physical play. A 12-play, 69-yard drive was finished off by a DeLuca 12-yard touchdown that restored the three-score lead. KP then went 51 yards in five plays that was ended when Frommer (19 carries, 102 yards) went over the right side for a 12-yard score. After an Attleboro punt, Giovanni Fernandez (eight carries, 103 yards) sealed the win with a 65-yard touchdown straight up the middle of the field. Attleboro managed to get another score 1:49 left to play. McGovern again looked deep and found Sam for a 37-yard touchdown. The Warriors (6-0, 4-0) have clinched a share of the league title and will have the opportunity to win it outright for the second time in the past three seasons (and the second time in program history) with a win at home against Taunton next Friday. Attleboro (3-3, 2-2) will try to close out the regular season with a win at Franklin next Friday at Pisini Field.